Manual guiding a contributor for using the SBL library. 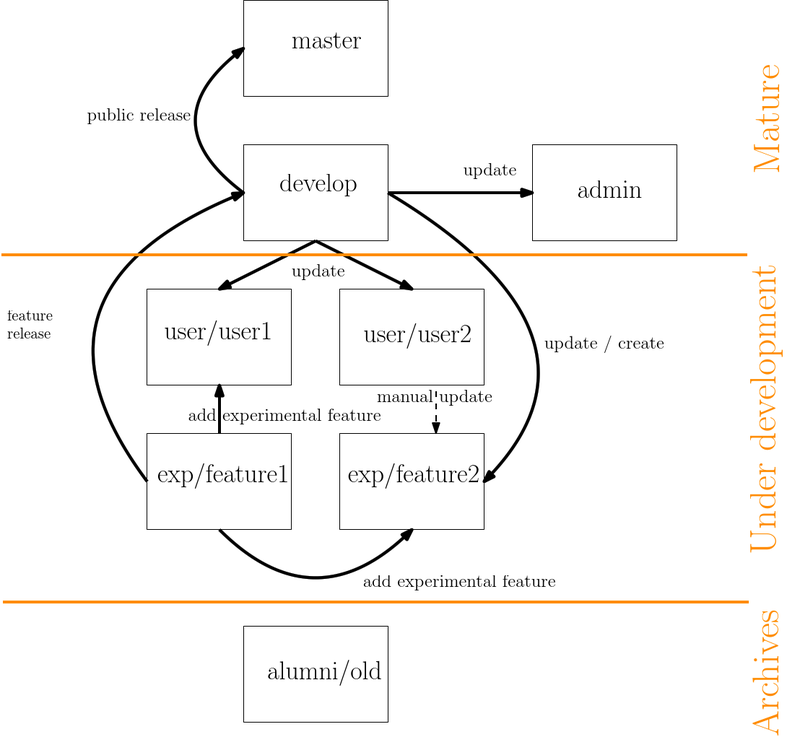 The following section details the architecture of the git of the SBL. The architecture is of prime importance for all collaborators contributing to the SBL. Overview of the git architecture: boxes represent the different types of branches and arrows the permitted operations between branches. The three categories of branches are the mature branches, the branches under development, and the archives. The code released is stored in the master branch. The master branch is only used for public purposes and is never directly edited. In particular, it is only updated by merging from the develop branch, as specified in the next section. Note that the master branch exists on two repositories : the GForge repository, only accessible from contributors, and the sbl.inria.fr repository, accessible from every body. All other remote branches are only available from the GForge repository. to share between all contributors all the code which is in production, and is about to migrate to the master branch. to receive new experimental features which have been thoroughly tested, and which are schedule to move into production. Similarly, updating a particular branch so that it is up to date with the develop branch is a simple merge. Note that the diff command is used for targeting which files differ from the develop branch, so that it is easier to group files to include in the new branch. The last command allows to copy one by one those files / directories into the new branch. Note that if there is an existing file / directory in the same path, it will be replaced with no warning. The administration part of the SBL is represented in the admin branch and is never used for updating any other branch. In particular, it contains the folders administration, website and sbl-scripts-devel. It is also the branch that contains the script that automates the update of the website and of the production branch. In order to work properly, the admin branch should be regularly up-to-date with the develop branch. In the following, we provide selected recommendations for C++ coding. Programs from the SBL typically dump their output into xml files, which is especially convenient to parse these output and compute statistics – see the package PALSE. Verbose level 0 (default) : no output gets printed. Verbose level 1 (run level): the program prints intermediate statistics on the tasks performed. Verbose level 2 (final statistics): the program prints the final statistics. Verbose level 3 (all, implicit behavior if -v is used): run level + final statistics. The implementation of algorithms should use a flage verbose whose semantics is that just decribed. Algorithms are integrated within workflows using so-called Modules – see the package Module_base , which offer a program line option –verbose. This option should be used to retrieve the verbose level passes to the algorithm at hand. First declare the list of classes implemented in the file. types, attributes, constructors, functors (if any), functions sorted by functionality. Method: declaration versus implementation. Avoid implementating while declaring, unless the method is very concise – and is likely to be inlined. Only those types used in the class interface must be public; that is, all internal types must be private. Template parameters: single word (no blank), first letter of each word capitalized. Template classes: prefixed with "T_", then the first word starting with a capital letter, then the remaining words separated by underscores. All other types: first letter capitalized, remaining words separated by underscores. Favor those which are private or protected. Define accessors modifiers to manipulate them – instead of returning references or pointers. body of method: short – fit on a screen that is circa 50 lines. split into subroutines if needed. variables with identical names is nested scopes: to be avoided. this bad practice is often resorted to for iterators, which are all called it or it_beg or it_end. Jupyter notebooks are used to give live demos of functionalities of applications – and also of selected packages. The goal is to provides a concise example illustrating (i) how to perform a calculation, and (ii) how to exploit the results, ideally using PALSE. Main specifications Main options. Input. Output. Remarks. Jupyter demo. Provides a file jupyter.ipynb, and also embeds the corresponding html version. finding files with a prescribed suffix, etc. showing images, showing the main log file, etc. To use these functions in a notebook, make sure sbl/python/SBL is in one's PYTHONPATH environment variable.